Hi and welcome to this edition of Workshop at the Ranch. For the past 7 months it has been my pleasure to bring you a series of in-depth articles featuring the capturing of Sports Action with Speedlights. I have explained how to use High ISO, Auto FP High Speed Sync, Fast Shutter Sync Speeds above a standard flash sync speed of 1/250, and the Nikon SB-900 Speedlights all in combination with the available ambient light both at indoor arenas and outside venues. Projects ranged from “Speedlighting” College Ice Hockey, Surfing, Motocross, White Water Kayaking, Rock-Climbing and the US Olympic Training Center’s athletes in training at the USOTC Aquatic Center and Cycling competitions at the USOTC Velodrome. My goal was to photograph sports in a dramatically lit style. For me, that dramatic style was accomplished with Off Camera Lighting using the Nikon SB-900 Speedlights. As explained in this series of Workshop at the Ranch articles I have been using some specific pieces of equipment and camera settings for my sports action with Speedlight projects. For these projects I used the Nikon D3s with clean High ISO and Auto FP High Speed Sync which allows me to use fast shutter sync speeds like 1/1000 and 1/2000 or faster as my flash sync speed. But it should be noted that many of the Nikon Cameras have this Custom Setting available. My Nikon SB-900 Speedlights are set to Remote and their power output is set to the Manual mode. The SANYO Eneloope rechargeable AA batteries give me about 275 images at Full Power. The Nikon SU-800 Commander controls all my Speedlight power output. The FourSquare by Lightware Direct holds up to 4 Speedlights, the Radiopopper PX system enables firing of my Speedlights over great distances, and the Michael Bass Design Fiber Optic Bundles guarantee the connection of the signal to my Speedlight’s sensor in midday direct sunlight. This system of Off Camera Lighting works in combination with the available ambient light of an indoor sports arena or the outdoor sports venue. This month’s series ending Sports Action with Speedlights article will feature the FourSquare and EightSquare Assembly, and the accessory gear that I used. At the conclusion of this article I have listed the links to several Videos made during some of this years projects involving the FourSquare and EightSquare. Also listed are links to the various company websites that make and distribute the gear I use. Well, onto the final chapter of the Sports Action with Speedlights series. Image #1 Travel Size for Your Convenience … This past year I have been lighting everything from indoor arenas to outdoor sports venues with Speedlights and a variety of accessories that all fit into one airline size roll-aboard case. This is my old Light Walker roll-aboard camera gear case by Lightware (I’m told a newer Light Walker will be released soon.) It holds 2 FourSquare Kits (a single FourSquare Kit includes a FourSquare Mount and a 30in. x 30in. Soft Box which collapses down into a travel size 18 inch pouch.) I also take 2 extra FourSquare Mounts and 2 extra Hand Grips in case I need 3 or 4 separate light positions. My Light Walker also holds 8 Nikon SB-900 Speedlights and 2 Nikon SU-800 Commanders. Also included are 2 Radiopoper PX Transmitters and 4 PX Receivers, 4 Michael Bass Fiber Optic Bundles, and 32 SANYO Eneloop Rechargeable AA Batteries (4 batteries per Speedlight.) I also take 4 Manfroto (formerly Bogen) Super Clamps, 4 Manfroto #155 Double Ball Joint (sometimes called a Double Ball Tilt Head, and I have 4 Manfroto 5/8 to 3/8 Rapid Adapters, Safety Cables, and of course a small roll of Gaffer’s Tape. With this single carry-on case of gear I can light almost anything. And yes, it easily makes airline size and weight restrictions. Image #2 The FourSquare and optional Hand Grip … Here is the basic FourSquare Mount and the optional Handle or “Hand Grip” as I call it. Not to be confusing, but I have called it a “Hand Grip” throughout my articles because the idea of a hand held support originated when I showed Lightware my old Nikon “Pistol Grip” as a possible support accessory to the FourSquare. Lightware liked the idea and introduced the Handle, but I got in the habit of calling it a Hand Grip. 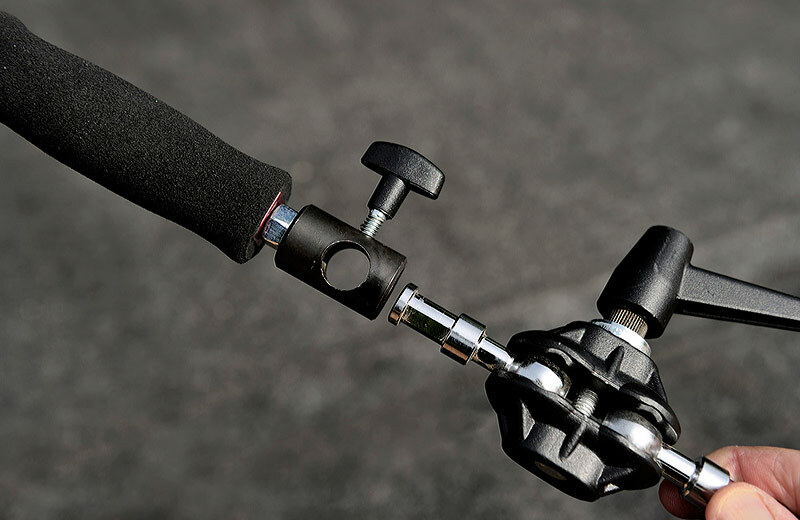 There is a “Spacer” that connects the FourSquare Mount to the Hand Grip. This FourSquare Mount and Hand Grip is what I use for supporting 1-4 Speedlights in an easy to hand hold lighting rig. The Spacer that comes with the Hand Grip is also used to attach an additional FourSquare Mount so as to make what I call the “EightSquare” that can support up to 8 Speedlights. 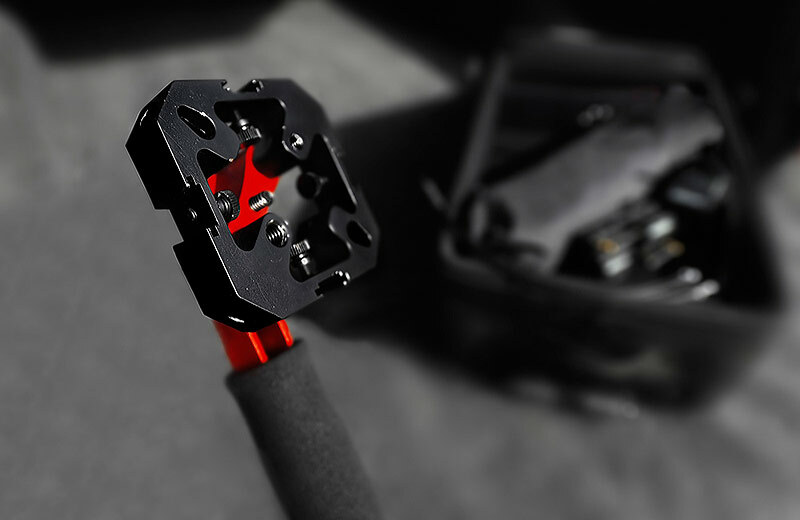 Image #3 The EightSquare … Here are 2 FourSquare Mounts attached to the Hand Grip using the Spacer that comes with the optional purchase of the Hand Grip. I call this the EightSquare. Image #4 The Manfroto 5/8 -3/8 Rapid Adapter … I like to use the Hand Grip as the main support piece for connecting the FourSquare or EightSquare to a lightstand, tripod, monopod or Manfroto Super Clamp. There are a few pieces of accessory gear that I use for this. Here is the 5/8-3/8 Rapid Adapter by Manfroto. It simply screws into the bottom of the Hand Grip. Image #5 The Manfroto #155 Double Ball Joint (or Double Ball Tilt Head)… This is a very handy piece of gear. 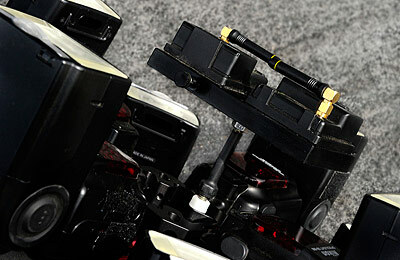 It has 2 posts, each connected to a ball joint housing so that they move independently from each other in any direction. It has a ratchet lever to tighten or loosen the joint. 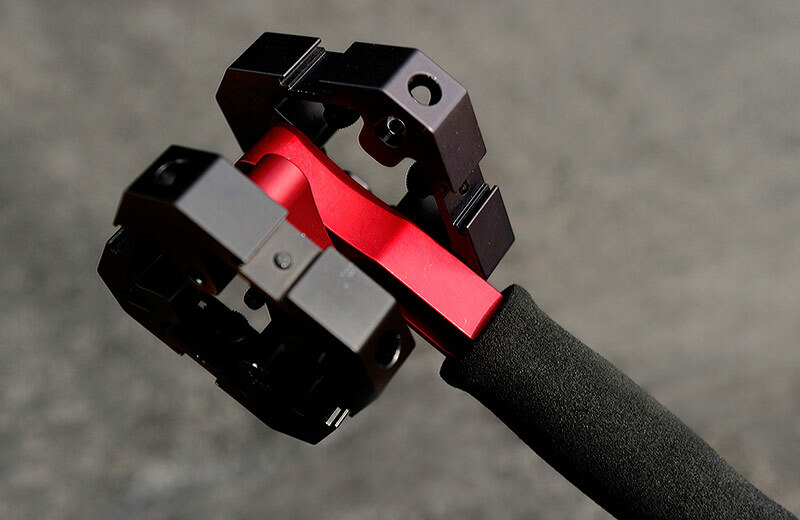 It is key to enabling me to tilt and angle the FourSquare while it is connected to a lightstand, tripod, monopod or inserted into a Super Clamp. Image #6 Double Ball Joint and 5/8–3/8 Rapid Adapter … One post will insert into the bottom of the Rapid Adapter while the other post can connect to a lightstand, a tripod, a monopod, or insert into a Super Clamp. It is the Double Ball Joint that allows me to tilt and angle the FourSquare or EightSquare while it is connected to a lightstand, tripod, monopod or Super Clamp. This is perfect for studio or location work when you want to secure the Speedlights off camera and aim the Speedlights at the subject. 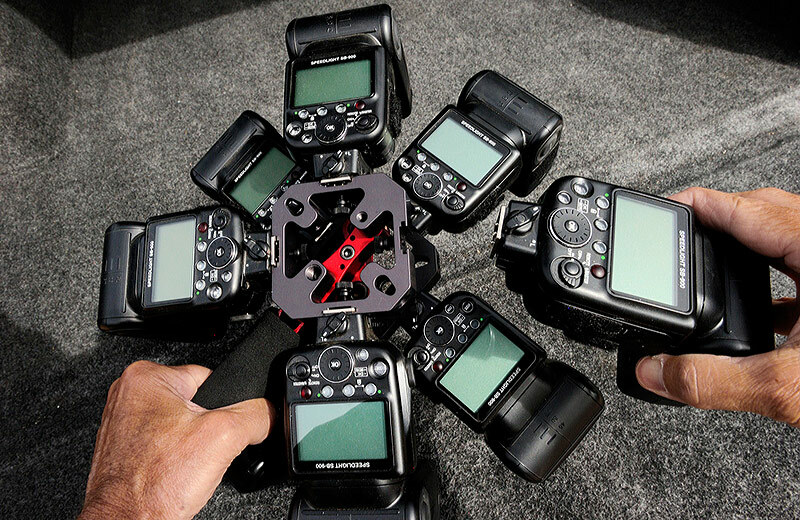 Image #7 The EightSquare with 8 Speedlights … Each FourSquare Mount provides 4 cold shoe slots to attach a Speedlight. With my 2 FourSquare Mounts connected to the Hand Grip using the Spacer I can attach up to 8 Speedlights. With each SB-900 capable of about 125ws the EightSquare of 8 Speedlights produces about 1000ws of power. The unseen heroes in this image are the SANYO Eneloop Rechargeable AA Batteries that I use to power the SB-900 Speedlights. They remain cooler than other batteries, they recycle to full power in 2.3 seconds, and I get about 275 full power flashes on a single charge. I have never used any external power supplies. I like to keep the rig lighter and simpler. 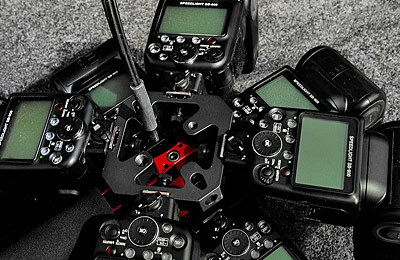 Image #8 The Nikon SU-800 Commander, Radiopopper PX Transmitter and PX Receivers, and Michael Bass Design Fiber Optic Bundles … These key accessories are paramount to my sports action with Speedlight image making. The Nikon SU-800 Commander can remotely fire my off camera Remote Speedlights via infrared signal. This works well indoors or outside on cloudy days up to about 60 feet. A sunny day is a different story as sunlight can interfere with the infrared signal, thus reducing the SU-800 Commander’s distance capability. The Radiopopper PX system has been a terrific solution. The PX system allows me to use i-TTL if I choose to, and most important the Auto FP High Speed Sync mode for sports action. All this and at much greater distances even in sunlight. 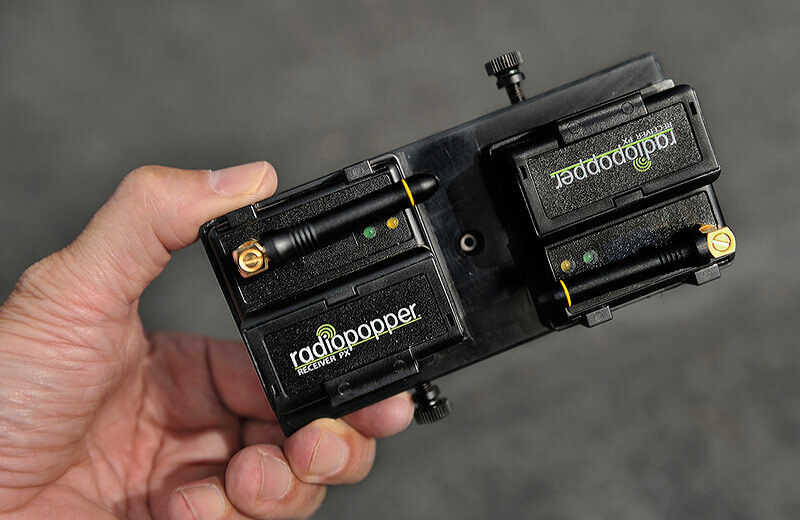 Simply said, the Radiopopper PX system converts the Nikon infrared signal into a radio signal that has given me successful firing of my Speedlights up to 325 feet away in sunlight. 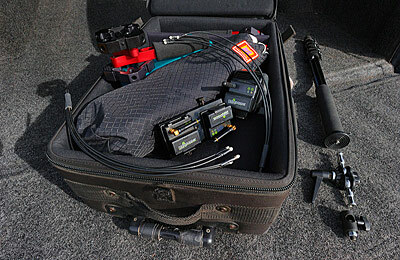 The Michael Bass Design Fiber Optic Bundles allow me to use only 2 Radiopopper PX Receivers to service 8 Speedlights and they also help make an uninterrupted connection to each Speedlight sensor. With the SU-800 Commander on my camera’s hotshoe I can control all the power output of the Speedlights. 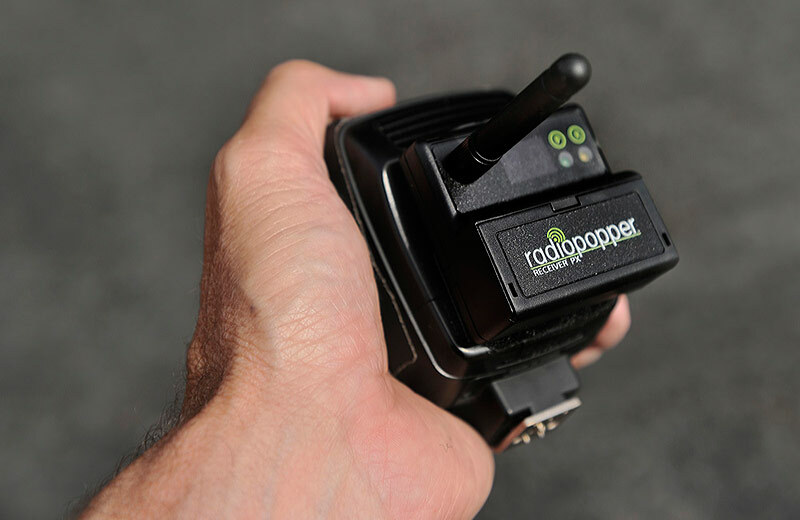 The Radiopopper PX Transmitter simply Velcro’s to the front of the Commander. Since incorporating the Fiber Optic Bundles the midday direct sunslight firing percentage has been 100%. 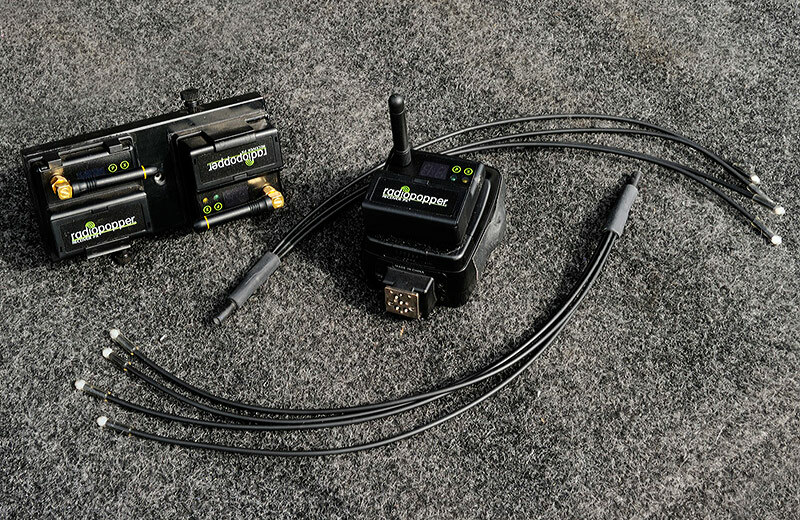 Image #9 Receiver Mount and 2 Radiopopper PX Receivers … Michael Bass Design also offers a Receiver Mount that holds 1 or 2 Radiopopper PX Receivers which then attaches to the FourSquare Mount. Remember by using 1 Michael Bass Design Fiber Optic Bundle, which is a 4 splitter between the PX Receiver and the Speedlight sensor, only 1 PX Receiver is needed to service 4 Speedlights. A good money savings. Radiopopper does provide a small gasket that fits between the Receiver sensor and the Speedlight sensor. It works but is a bit temperamental to keep positioned directly over the Speedlight sensor. Thus, I have opted to use the Fiber Optic Bundles to gain 100% efficiency in firing of my Speedlights whether indoors or outside. Image #10 Receiver Mount backside… This image shows the backside of the Receiver Mount. The post simply screws into the FourSquare Mount. The 2 holes are for the Fiber Optic Bundle to fit into and thus make the connection to the sensor on each Radiopopper PX Receiver. Image #11 Receiver Mount attached … The Receiver Mount screws into the FourSquare Mount. I like to attach it on the front side of the FourSquare or EightSquare. I have not noticed any difference in firing performance when the PX Receivers are in front or back of the FourSquare Mount. 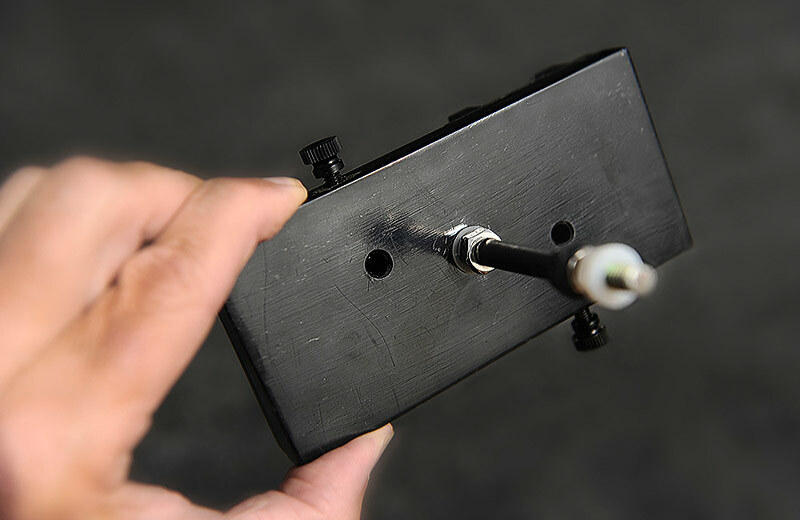 Image #12 Michael Bass Design Fiber Optic Bundle … The Fiber Optic Bundle slips through the FourSquare Mounts, in this case the EightSquare, and into the hole in the back of the Receiver Mount which connects to the PX Receiver sensor. 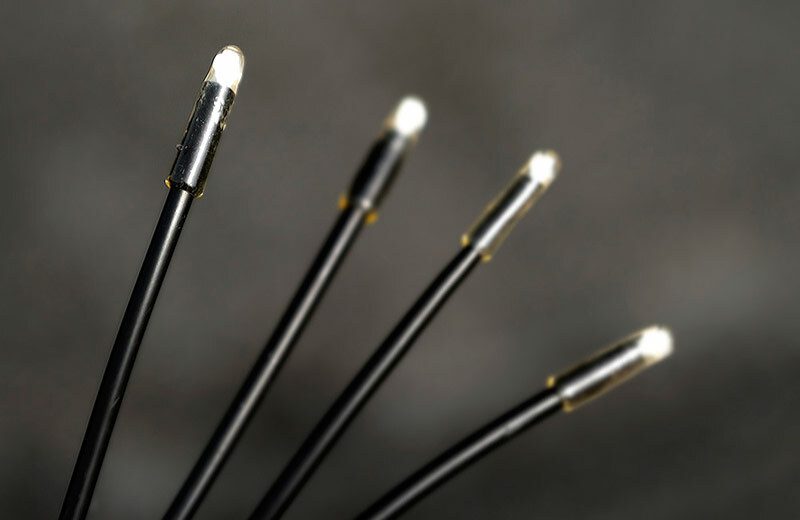 Image #13 Fiber Optic Tips … While one end of the Fiber Optic Bundle is inserted into the hole on the backside of the Receiver Mount and thus connects to the Radiopopper PX Receiver sensor, the other end of the Bundle is the 4 fiber optic tips. Each tip will connect to a Speedlight sensor. Here are the 4 tips of 1 Fiber Optic Bundle. Image #14 Fiber Optic Tips and Speedlight Sensor … The Fiber Optic Tips are simply attached to the Speedlight sensor using Gaffer’s Tape. The Gaffer’s Tape makes a light seal that prevents any sunlight from interrupting the signal. Keep in mind that the Fiber Optic Bundles are not a flexible cord so be gentle when positioning them. Also, be generous with the Gaffer’s Tape and make a strong light seal. 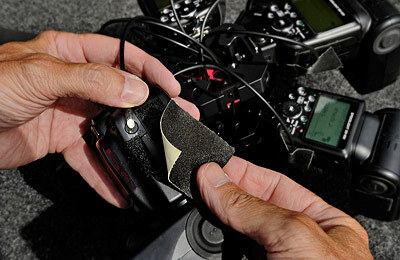 This is key when firing the Speedlights outdoors during midday direct sunlight conditions. Image #15 Nikon SU-800 Commander and Radiopopper PX Transmitter … These two items are easily attached together by Velcro. 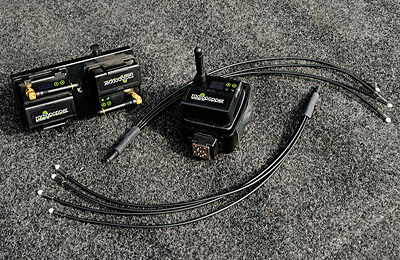 I can now connect the SU-800 Commander to my camera’s hotshoe and control the power output of my Speedlights while the Radiopopper PX system allows me to do so from over 300 feet away. The Radiopopper PX system is essential if you want to shoot i-TTL and, or use fast shutter sync speeds for sports action with Nikon’s camera Custom Setting of Auto FP High Speed Sync. Image #16 The EightSquare … Well, here it is, the EightSquare. 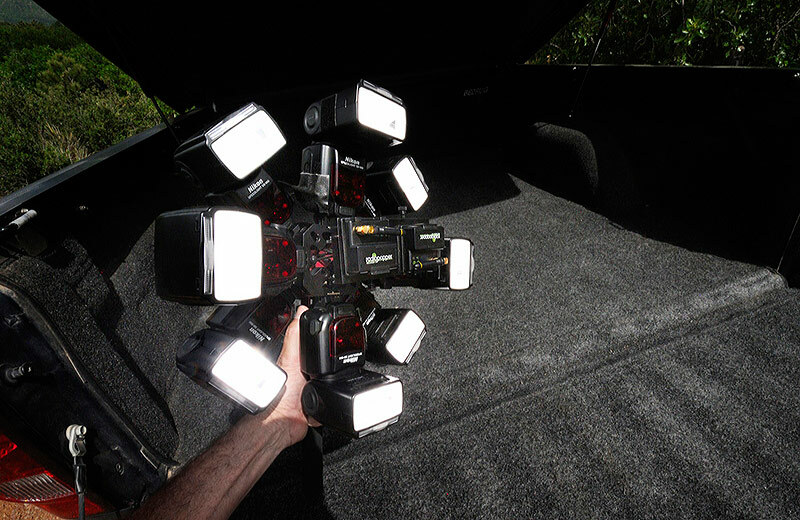 By combining 2 FourSquare Mounts I have attached 8 SB-900 Speedlights, roughly 1000ws of power. This is one big portable light source that enables me to photograph sports action using fast shutter speeds like1/500, 1/1000, 1/2000 or faster thanks to the Auto FP High Speed sync Custom Setting in my Nikon camera. The Nikon SU-800 Commander, Radiopopper PX system and Michael Bass Design Fiber Bundles allow me to fire my Remote Speedlights from over 300 feet away, even in midday direct sunlight. The SANYO Eneloop Rechargeable AA Batteries give my SB-900 Speedlights a 2.3 seconds recycle time and about 275 firings at full power. For my sports action jobs I set my power output Manually rather than i-TTL. By setting the power output Manually, like a traditional strobe, I have the capability of using all the power that each Speedlight can produce. Image#17 EightSquare Mounted … Whether I use a FourSquare or EightSquare set-up I always use the Hand Grip (Handle) as my main support piece. 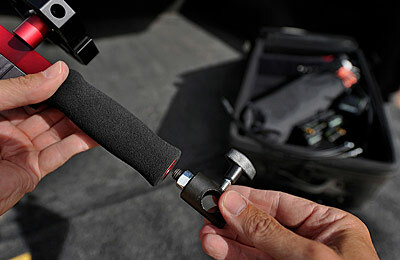 The Hand Grip makes a FourSquare easy for an assistant to hand hold and maneuver around a subject. The EightSquare is of course a bit heavier and so I either connect it to a monopod for an assistant hold, or connect it to a lightstand, Super Clamp or tripod as this image illustrates. 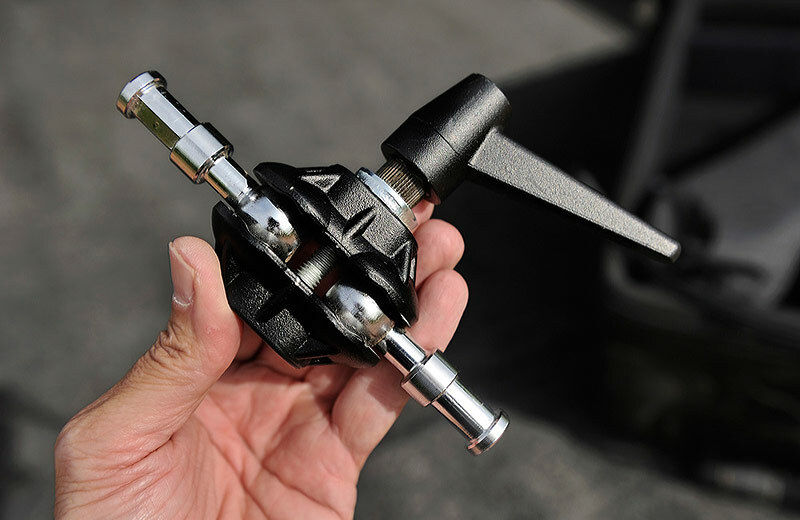 Whether it’s a FourSquare or EightSquare I find the Manfroto 5/8-3/8 Rapid Adapter and #155 Double Ball Joint the easiest system to use when connecting the Hand Grip to a lightstand, tripod, monopod or Super Clamp. Image #18 FourSquare Gymnast Studio Set-Up with Soft Boxes … Here is a job where I used the FourSquare 30in. x 30in Soft Box that comes standard in the FourSquare Kit. I’m not sure what material they use but the reflectivity and light quality is beautiful. 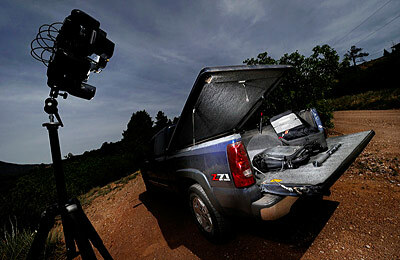 This image illustrates how 2 FourSquare Kits can be used for a portable studio set-up on location. I use the optional FourSquare Hand Grip along with the Manfroto 5/8-3/8 Rapid Adapter and #155 Double Ball Joint to mount the FourSquare to the lightstand. The Double Ball Joint enables me to tilt and angle the FourSquare towards my subject. The main Soft Box on the right in front of my subject has the Front Diffusion Screen on so as to wrap my subject with soft light. 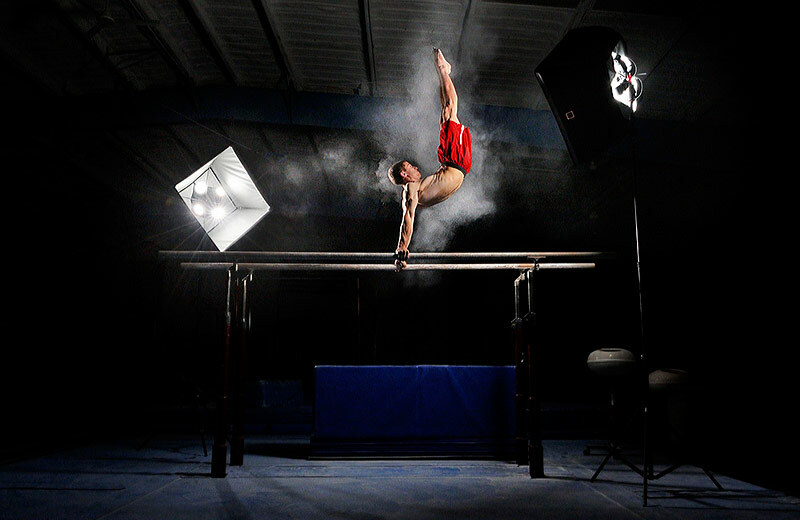 The back Soft Box behind my subject on the left does not have the Diffusion Screen and is a more direct light that rim lights the athlete and illuminates the gymnastics chalk floating in the air. Image #19 FourSquare Gymnast … Photographing sports action with a studio lighting set-up makes a unique stylized image. This “Cross Light” set-up is common to studio portraiture but I also use it for what I call an “Action Portrait.” This FourSquare studio set-up is completely portable and easy to move around my subject while shooting on location. 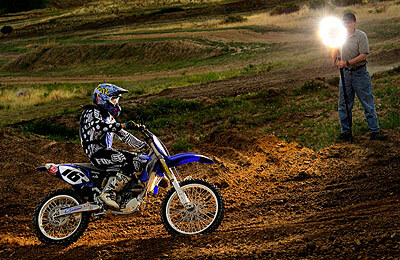 Image #20 EightSquare Motocross Set-Up … Outdoor use of lights can be a challenge. First of all, your lighting gear must be portable and battery operated. Second, it must be powerful enough to illuminate your subject in sunlight conditions and for sports action it must be located a safe distance from the action. Third, the lighting system must allow you to use High Speed sync which enables images to be made with fast shutter sync speeds like 1/500, 1/1000, 1/2000 or even faster. The FourSquare or EightSquare with Nikon SB-900 Speedlights is that system. Image #21 EightSquare Motocross … Illuminating a moving subject can be tough. I could place my EightSquare off camera on a lightstand or tripod and create a “Flash Zone” of light on the field of play that would be stationary and narrow. I can only take the picture within that area that is lit by my Speedlights. But by using my assistant Brad to follow my moving subject with the EightSquare I can increase the size of my Flash Zone as he follows the subject around the curve. My chances of making a stylized action picture are greatly increased as I can now shoot a picture at any location in the curve. 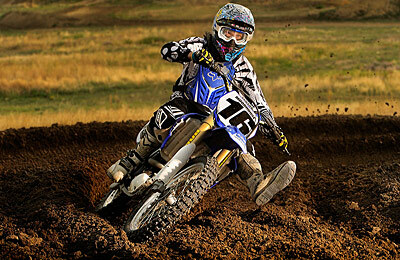 Either way my goal of making a stylized sports action image with Speedlight is accomplished. It is my hope that this series of articles featuring Sports Action with Speedlights has helped many of you who shoot sports to stretch out of your comfort zone of available light and take on the challenge of Off Camera Lighting. I suggest reading and rereading the past Workshop at the Ranch articles to fully gain some insights about this exciting new technology and equipment. The following links will connect you to several videos that Paul Perrigrine at Lightware made of me working on a variety of projects and jobs over this past year. From Speedlighting College Ice Hockey to Surfing to Motocross these videos are free to view and help you to understand how I have been photographing Sports Action with Speedlights.